Do you ever feel you get caught up in the urgency of the day you forget to notice the small moments of joy hiding in the grind? When there is so much demanded of us as mothers, it’s easy to trade in living slowly for living in response mode. Response mode means you are reacting to your situation instead of actively engaging and creating your life. And I get it, we ARE moms, part of that role is to respond to our children’s needs. There’s no way to anticipate every whim our child has, I’m looking at you toddler stage, but there are ways to craft joy and enjoy it while we are surfing this awesome wave of parenthood. So begins a little series I’m calling “crafting joy.” Posts bursting with simple tasks and ways to architect your day with joy as the foundation. But a quick disclaimer before we dive into part one, I’m not saying important and urgent things won’t come up by crafting joy. I’m not saying it will be easy, in fact, I think until we have built the mindset of crafting joy, starting and staying consistent is very difficult. Allowing yourself to stay in constant alignment with joy may be one of the hardest things to do, which is why it’s so important to develop a mindset that acknowledges joyful moments and seeks to create them. I am 100% positive the minute you start, you will notice a trend that spirals upwards and the more you practice it, the higher and faster it will go. If you are rolling your eyes right now, trust me - I’ve rolled my eyes a few times about the idea of crafting joy. But Sarah, “I am so drained, adding one more thing to my day is the last thing I need,” you might be saying. Andddddd, I’ve said that too - honestly, I said it to myself today. And even in spite of feeling skeptical, or exhausted, or fighting against how much the world wants you to forget there is joy to be made, joy is sitting there waiting to come into your life. That’s what joy does, it sits and waits until its allowed in. Once you open the door, it fills up all of the space and turns the ordinary magical. So you can either roll your eyes and complain about your to-do list, or you can make a fifteen-minute effort in the midst of the chaos. I’m not going to do it for you, but I sure as hell hope to help you choose the latter. My favorite way to introduce joy into my day is to welcome it into one of the very first things I do - nourish my body. I think breakfast is the perfect way to feed our bodies and our souls. 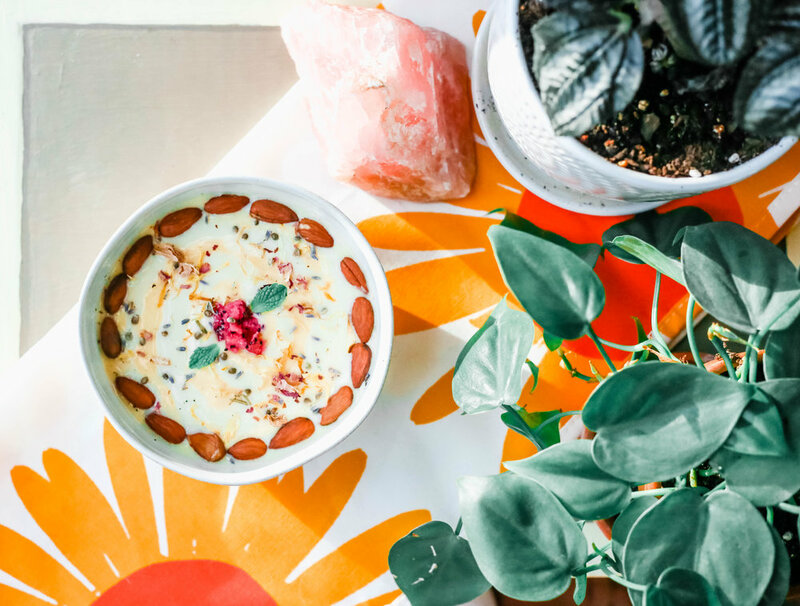 Smoothie bowls are our go-to meal. They are versatile enough to meet everyone’s dietary needs, chock full of nutrition (minerals, vitamins, proteins, and healthy fats), and are easy to bring on the go if it happens to be one of those mornings. So great, whipping up a smoothie is what will bring all the joy into my life? Not really. What I’m really trying to say is by taking the time to make beautiful meals for ourselves, we are sending out a message of “I deserve beautiful food.” The joy doesn’t only come from the food, it comes from the experience we have while creating the meal. Put some music on while you stir in the ingredients and thank the food for giving your body all the nourishment it needs to live. 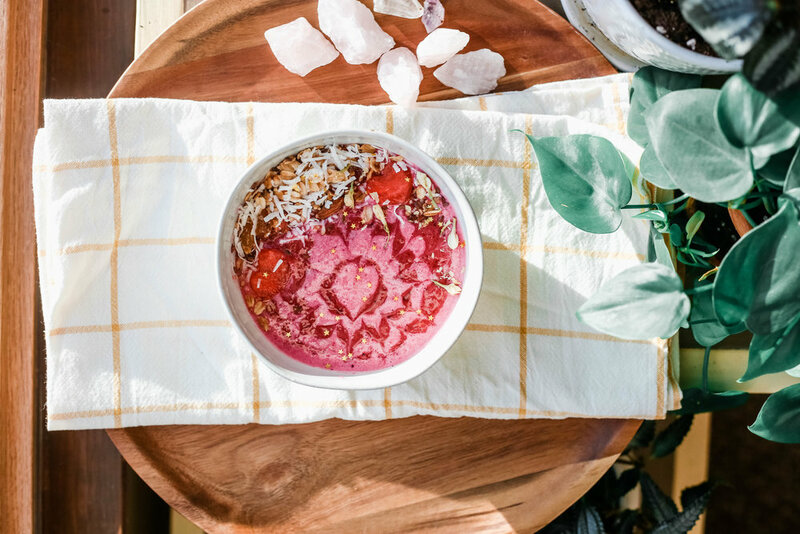 I think when we do this, we are honoring the gift food is giving us, acknowledging the joy in preparing delicious and healthy foods, and sending out a message of gratitude for the little things, like blended frozen fruits. It’s a lot easier to dump your smoothie into your Yeti cup, plop in a straw, and rush around trying to multitask, but it is so much more enjoyable to take a few minutes plating your food beautifully and eating it in the sunshine. We all have ten minutes we can spare, we truly do. So don’t talk yourself out of taking the time to create those magical, joyful moments. We only have today, make it what you want it to be.